OLYMPIA, Washington, August 20, 2015 (ENS) – Three U.S. Forest Service firefighters died Wednesday night when a wildfire near the small town of Twisp in southeastern Washington overtook their vehicle after it crashed. Four other firefighters in the same area were injured, one critically. Officials are investigating the exact cause of the deaths. 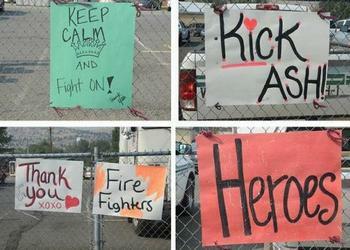 The deaths occurred on a cluster of fires known as the Chelan Complex, near the Chelan Lake recreational area. 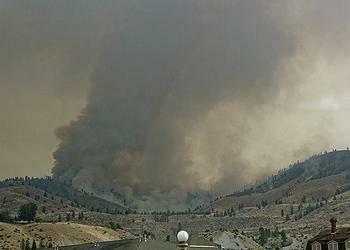 Approximately 1,200 residents in the greater Chelan area have been evacuated. At least 39 homes have gone up in flames, but firefighters are gaining control and the fires are about 50 percent contained, officials say. This year, 13 firefighters have lost their lives across the Western states trying to control blazes that erupted during the record-breaking drought. Wednesday’s deaths occurred in the Methow River valley 115 miles northeast of Seattle, in a cluster of fires covering about 140 square miles. Inslee Wednesday requested a federal Emergency Declaration to provide additional resources to cover some of costs related to the many wildfires burning across Eastern Washington. The governor’s request was sent to President Barack Obama through the Federal Emergency Management Agency. He said that currently 11 counties and four tribes are affected or threatened by fires. Officials have confirmed that the fires have destroyed more than 50 homes, 60 other structures, and more than 235,000 acres of land. 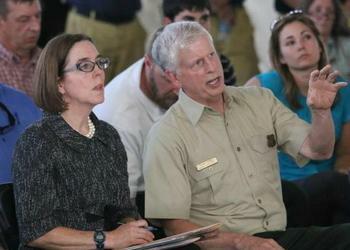 In Oregon, Governor Kate Brown has activated Oregon National Guard members to assist in fire fighting. About 125 soldiers will begin training this week in Salem. Already this summer, the National Guard has dedicated four Blackhawk helicopters and support personnel to battling the blazes. One of the worst in Oregon is the Canyon Creek fire burning south of the towns of John Day and Canyon City on the Malheur National Forest, Bureau of Land Management, and private lands protected by the Oregon Department of Forestry. Hundreds of area residents have been evacuated. Hot and dry weather forecast for Friday has prompted officials to issue a Red Flag Warning for the area. Today the Canyon Creek Complex hosted a visit from Governor Brown, Oregon Department of Forestry Doug Decker, and U.S. Forest Service Chief Tom Tidwell. They toured the fireline, attended a meeting with homeowners, and then were briefed by fire personnel on the current fire conditions. Currently, there are 14 major fires burning in Oregon. 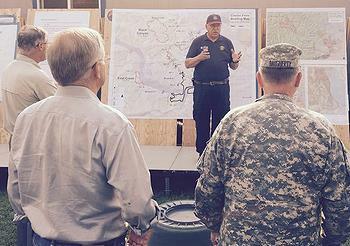 Such significant wildfire activity draws down available firefighting resources, the governor said. “Prevention is crucial. We need every Oregonian and visitor to be fire-savvy and aware of fire restrictions and common-sense practices,” said Brown. More than 26,000 firefighters are battling at least 100 large blazes across the parched Western states of California, Idaho, Oregon, Montana and Washington, where high winds and high temperatures fanned the flames today. “Development close to forests has also increased the threat to property, with more than 46 million homes in the United States, or about 40 percent of our nation’s housing, potentially at risk from wildfire,” said Vilsack. The secretary, who has jurisdiction over the U.S. Forest Service, said the country is spending more than $150 million per week on fire suppression activities, and predicted that amount will increase this season. Fire officials have deployed 28 next generation and legacy air tankers, with additional helicopters, said Vilsack. “One of our most critical assets in this fight is the courageous firefighters who work on the front lines. There are more firefighters on the ground today fighting fires than at any time in the nation’s history. They work nights, weekends and holidays under difficult circumstances,” Vilsack said. He said the federal government is now working with the U.S. military and foreign partners, such as Canada, Australia, and New Zealand, to bring in additional firefighting resources.